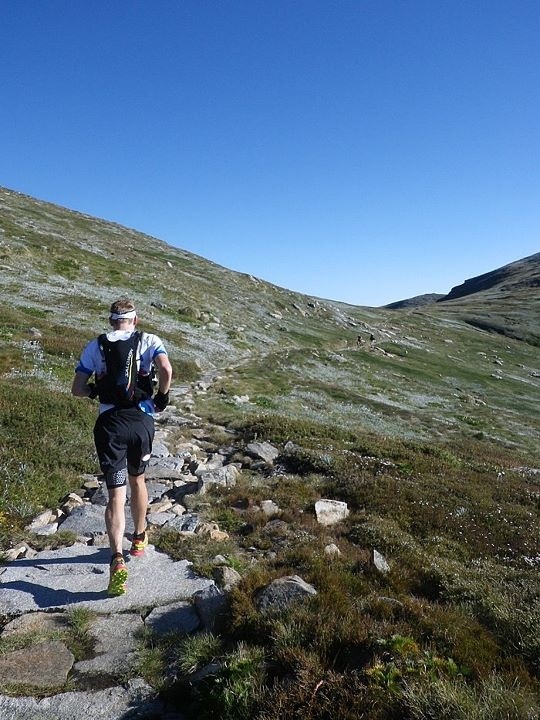 With quite a few of the big trail races in Australia taking place right now, including many of our 100km and 100 mile events, working out the pace at which you’re going to run your race can be pretty crucial as to how well you finish overall. Compared to marathons, where people aim to keep a constant pace throughout, trail races can be a very different kettle of fish as terrain and sometimes the heat can play a big role in our overall pace. c.) A lack of understanding of our own ability. Anecdotally, women do appear to be far better at pacing themselves than men – there’s this little thing called testosterone that gets in the way with us males! 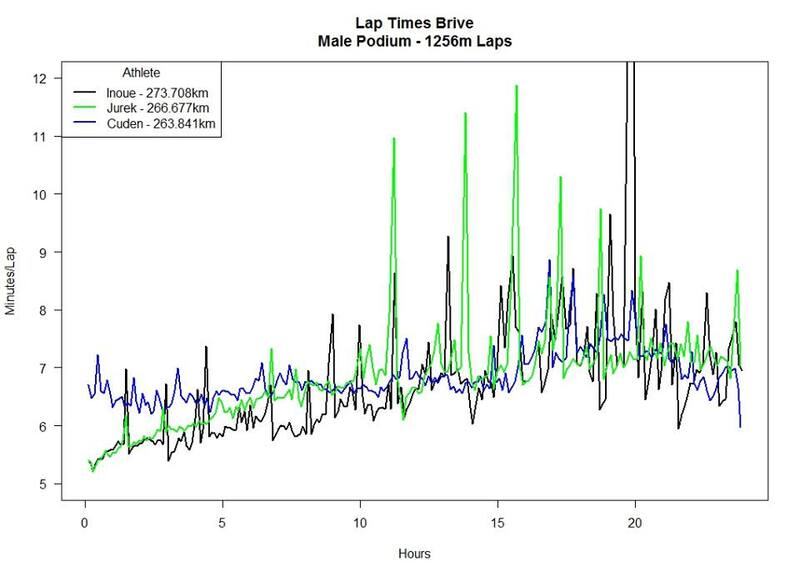 While every runner is different, the above graph shows that Jurek and race winner Inoue went out pretty hard, but the difference between them is that Inoue took slightly longer walking breaks early on in the race, compared to Jurek who between 10 and 15 hours, had some laps blow out in a big way compared to the other two. Cuden, who finished third in that race was a lot more consistent throughout the entire race, and bar a rough patch between 18-2o hours held a very constant and steady pace with plenty of walking breaks. But what does all this mean? The question we try to reason within ourselves is invariably this – If we head out too slowly, is this time we could have made up later on in the race, meaning that we could have gone quicker? For example, this is a question Cuden might have been asking himself when reflecting upon his splits above. To be honest, it’s a discussion I’ve heard so many times at the end of a race, when someone has finished feeling great and then proceeds to believe that they could have even quicker had they pushed the pace a little more early on. But, had they pushed that pace too much early on, what kind of effect would it have had on their race if they had done so? Would that extra effort come to haunt them later on in the race, meaning a greater slow-down and a worse time? Which is what we saw to some extent in Jurek’s performance. Inoue, despite going out hard with Jurek, ultimately was able to hold on a little better than Jurek in the second half of the race. So how do you get it right? Well, there’s three simple things that we mentioned above that contribute to getting your pacing right and we’ll go through them one by one. There are others too, but we like to make things easy! So what do we mean by lack of preparation? Quite simply, it’s a lack of the appropriate amount of kilometers for the race that you’re entering, which then leads you to believe that you can head out at a certain pace, based upon what you might have run in the past. When you approach the race that you’re running, one tip to make sure you stay grounded in reality is to make sure you look at the preparation you’ve done specifically for that race. How many kms or miles have you done in this block of training for this race? All too often, it can be very easy to think, ‘It’s OK, I’ve run 12hrs for 100kms before, I should easily be able to replicate that.’ Wrong. I’ve been there, done that and bought the t-shirt. It’s crucial to look at what training you’ve done in respect to the race you’re entering, not what you did last year before you had a two month break and then started doing a bit of training again. A tip I always follow is to have a mental target as to the number of kms I need to put in for any given distance. This will vary between runners and what they want to achieve, but I use the following benchmarks, based on the time I have available to me. For anything up to a marathon distance, I’ll make sure I’ve done between 1,200 – 1,500kms in preparation and then depending on the terrain of the course, set a number for the amount of vertical kms I want to achieve too, along with an analysis of the average pace of those kms or miles. Generally speaking, we tend to find that people fall into one of two categories, those who do and those who don’t understand their own ability. In respects, we’re our own worst enemy when it comes to giving ourselves an informed judgement as to what our ability actually is, and some of that comes down to a societal thing. Ultra runners are generally extremely humble in nature. So this is not an issue for many of us I’m sure. But if you look across wider society, you do tend to see a culture where mediocrity is celebrated and there is a need to give constant praise. I’m sure in our working lives we see it among many people we know, who seek adulation and applause for simply performing their jobs. I guess the trick is to not fall into a trap of celebrating mediocrity and staying grounded in our ability. So what do you do as an ultra runner to help provide that sense of objectivity? Well there are a number of things. The first is to go to point one above and look at all of the training you’ve done and try to remove yourself from the emotional connection you have to it. Afterall, it’s your training, you’ve invested in it and of course you’re going to believe you can run that sub 10 hr 100kms. But when you really critically self-analyse, have you done the hard yards to get there? If you struggle with that, get another person to look at your training. Someone with experience who can give you an honest appraisal as to where you might be at and what’s achievable. This is where a coach pays dividends as they’re not emotionally invested in your training and can give you a blunt and honest assessment. There are many people who run a cracking race, pace wise who have never set foot on a course before, but similarly there are many that don’t because of it, and the reason is not necessarily logging thousands of kms or miles on the track (although it helps! ), but more so understanding and researching the course before you race. One of the major reasons why pacing yourself in an ultra is a very difficult thing to get right is not because of the above two items (although they play a major part), but because of the huge amount of variable we see in terrain over the course of our chosen race. A perfect illustration of this is Australia’s largest trail marathon, Six Foot Track. Pacing yourself right in this race is vital if you want to secure the best time you can, and it’s all about understanding the different variable and when to push and when to hold back. Six Foot is a great example because of the nature of the track. There is 15kms of sweeping downhill at the start, 10kms of mountain climbing and then 19kms of quad-sapping undulating trails. Every year we hear tales of heroic blow-ups and it’s because of one thing- people running far to quickly in the first 15kms because it feels so easy to do so. As with any ultra, you have to weigh up and reconcile with the fact that whatever you put in early on into the race, it’s going to affect you later on. So despite the fact that the first 15kms of your race might feel incredibly easy, will you still be running this pace in the last 5-10kms? The answer is probably no. How fast is my ticker (heart) going? Despite all the technology and data that is around for us to analyse, simply use that as a guide. The real indication you should always listen to is your heart. Walk when you need to walk and don’t be afraid to do it early and often – it will save your race later on in the day and also make for a far more enjoyable experience.